Ford Inside News Community > Discussion Area > The Lounge > the sky is falling . . .
Re: the sky is falling . . .
Well, That ozone thing can crash and burn for all I care. Now the Mar's thingi is cool!!! As the Mars Curiosity Rover descended through the atmosphere of Mars, humans on their couches weren't the only ones watching. The Mars Reconnaissance Orbiter, NASA's Martian satellite, was also looking -- and taking pictures. Today, the MRO released an image of the rover descending, still attached to its parachute and before the heartstopping Sky Crane maneuvers. (below) You can see it up there on the upper left, labeled (1). What you're looking at is a large parachute -- 16 stories tall, 50 feet in diameter, the largest ever flown outside the Earth-Moon system -- and beneath it, the one-ton rover with its "backshell" on. The parachute is on the upper right (rendering), labeled (2). The asteroid 2012 DA14 will fly extremely close to Earth on Friday, Feb. 15, but poses no risk of impacting our planet. It may, however, be visible in backyard telescopes if you know when and where to look, but will be a stargazing challenge, NASA says. Discovered last year, asteroid 2012 DA14 is about half the size of a football field and will approach within 17,200 miles (27,680 kilometers) of Earth when it flies by during its close encounter. MOSCOW (AP) — A meteor streaked across the sky over Russia's Ural Mountains on Friday morning, causing sharp explosions and reportedly injuring around 100 people. ...Reports conflicted on what exactly happened in the clear skies. A spokeswoman for the Emergency Ministry, Irina Rossius, told The Associated Press that there was a meteor shower, but another ministry spokeswoman, Elena Smirnikh, was quoted by the Interfax news agency as saying it was a single meteorite. The moon has a new hole on its surface thanks to a boulder that slammed into it in March, creating the biggest explosion scientists have seen on the moon since they started monitoring it. ...When researchers looked back at their records from March, they found that the moon meteor might not have been an isolated event. "On the night of March 17, NASA and University of Western Ontario all-sky cameras picked up an unusual number of deep-penetrating meteors right here on Earth," Cooke said. "These fireballs were traveling along nearly identical orbits between Earth and the asteroid belt." ..."We'll be keeping an eye out for signs of a repeat performance next year when the Earth-Moon system passes through the same region of space," Cooke said. "Meanwhile, our analysis of the March 17th event continues." Thats what the Moon is for. Rocks hit it, not us. GO TIGERS! BCS Orange Bowl Champs! Well i was also wondering how can their astronauts not know where it landed? Earth is about to have a close encounter with a house-sized asteroid on Sunday (Sept. 7), when a space rock discovered just days ago will zoom by our planet at a range closer than some satellites. 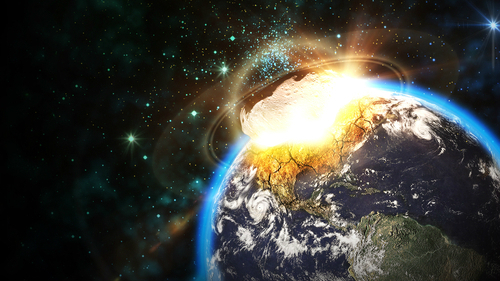 But have no fear, NASA says the asteroid won't hit Earth. 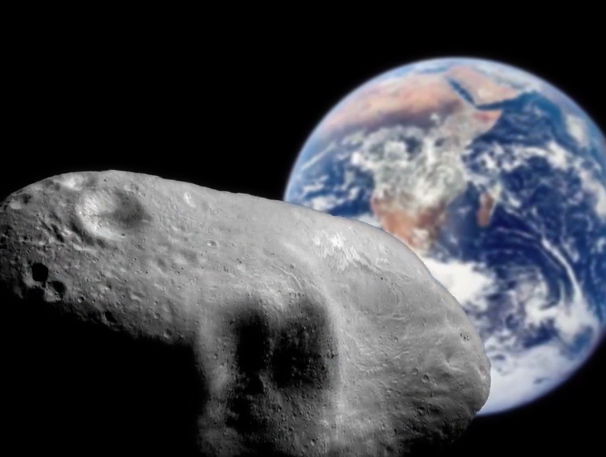 The asteroid 2014 RC will safely buzz Earth at 2:18 p.m. EDT (1818 GMT) on Sunday. At that time, the asteroid will pass over New Zealand and fly just inside the orbits of the geosynchronous communications and weather satellites orbiting Earth about 22,000 miles (36,000 kilometers) above the planet's surface, according to a NASA statement. During its close pass, 2014 RC will be about 21,126 miles (34,000 km) from Earth's surface. That's about 10 times closer to the Earth than the moon. "Asteroid 2014 RC was initially discovered on the night of August 31 by the Catalina Sky Survey near Tucson, Arizona, and independently detected the next night by the Pan-STARRS 1 telescope, located on the summit of Haleakala on Maui, Hawaii," NASA officials said in a statement. The American Meteor Society received over 145 reports from western states last night (February, 23th 2015) about a slow moving grouping of fireballs traveling from the south east to the north west. Witness reports indicate, the object travelled over a 1,000 mile distance and was seen from as far south as Arizona and as far north as Alberta CA. The phenomenon was seen from Arizona, Idaho, Utah, Montana, Nevada, California, Washington, Oregon, Wyoming, Alberta and British Columbia on Tuesday, February 24th 2015 around 11:00 PM Mountain time. ...From different sources, it looks like the phenomenom was the re-entry of the stage 3 of a Chinese Rocket. This rocket launched the sateliite Yoagan Weixing 26 on Dec 27, 2014. Shortly after this post was initially published, NASA’s Orbital Debris Program Office at JSC identified this object as the reentry of a Chinese rocket body (NORAD ID 40363).